Puget Sound’s endangered killer whales are becoming fully integrated into annual planning efforts that divide up the available salmon harvest among user groups — including sport, commercial and tribal fishers. 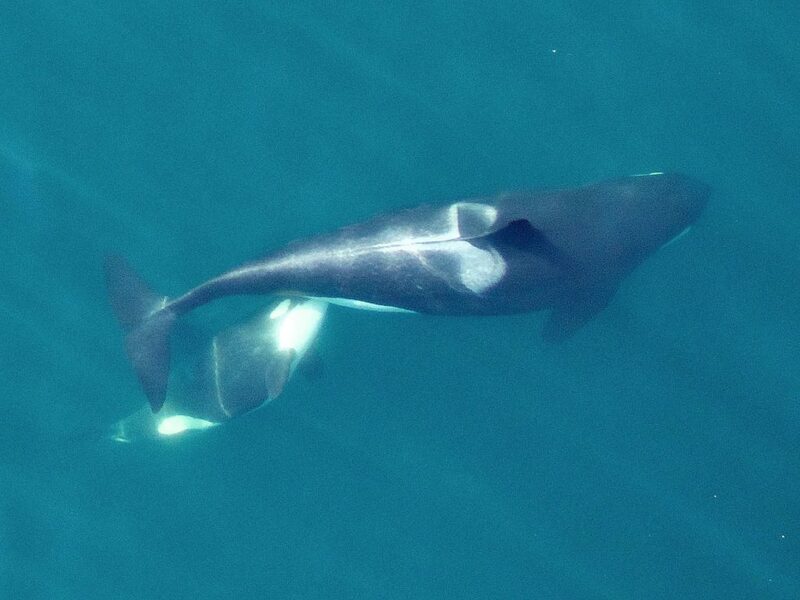 An orca mother named Calypso (L-94) nurses her young calf Windsong (L-121) in 2015. Photo: NOAA Fisheries, Vancouver Aquarium under NMFS and FAA permits. The problem with allocating a specific number of salmon to the orcas is that the whales cannot tell us when or where they would like to take salmon for their own consumption. The result, now in the planning stages, is to limit or close fishing in areas where the orcas are most likely to forage during the fishing seasons. As revealed yesterday during the annual “North of Falcon” forecast meeting, fewer chinook salmon — the orcas’ primary food — are expected to return to Puget Sound this year compared to last year, but more coho salmon should be available for sport and tribal fishermen. The challenge, according to harvest managers, is to set fishing seasons to take harvestable coho without unduly affecting the wild chinook — a threatened species in Puget Sound. Nearly a decade in the planning phase, it appears that the International Year of the Salmon couldn’t come at a better time for Northwest residents. More and more people are beginning to recognize the importance of chinook salmon to the long-term survival of our Southern Resident killer whales. 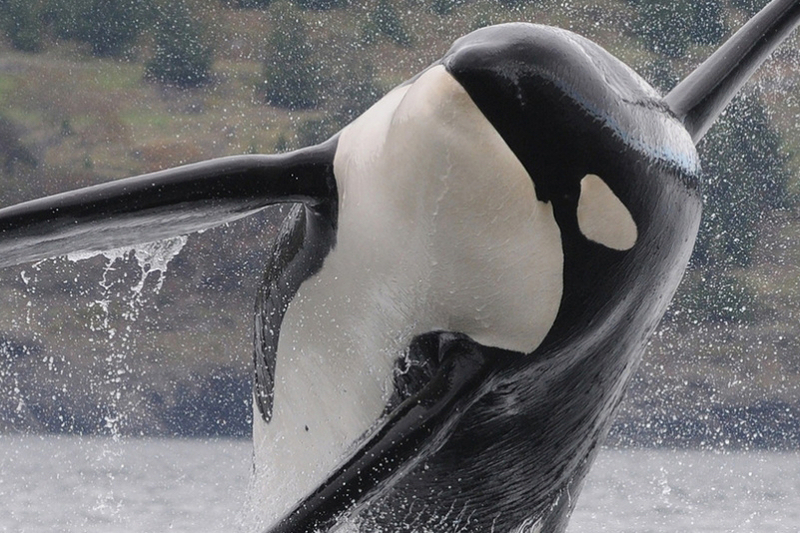 Legislation designed to improve the populations of salmon and orcas has gained increased urgency as these iconic creatures continue to decline. Many countries throughout the Northern Hemisphere have joined together in a campaign to raise public awareness about salmon this year and to increase the support for scientific research and restoration projects that might save endangered salmon from extinction. One exciting aspect of the International Year of the Salmon, or IYS, is a scientific expedition involving 21 researchers from five countries. This international dream team will depart Sunday from Vancouver, British Columbia, to engage in a month of research into the secrets of salmon survival. I described this long-anticipated endeavor in an article published today in the Encyclopedia of Puget Sound. Allowable fishing for chinook salmon in the waters of Canada and Southeast Alaska will be cut back significantly this year as a result of a revised 10-year Pacific Salmon Treaty between the United States and Canada. The goal of the updated treaty is to increase the number of adult chinook returning to Washington and Oregon waters, where they will be available to feed a declining population of endangered orcas while increasing the number of fish spawning in the streams, according to Phil Anderson, a U.S. negotiator on the Pacific Salmon Commission. Most chinook hatched in Washington and Oregon travel north through Canada and into Alaska, making them vulnerable to fishing when they return. Changes to the treaty should reduce Canadian harvests on those stocks by about 12.5 percent and Alaskan harvests by about 7.5 percent, Phil told me. Those numbers are cutbacks from actual harvests in recent years, he said, so they don’t tell the complete story. Most of us have heard that harbor seals eat Chinook salmon, which are the preferred food for our beloved Southern Resident killer whales, an endangered species whose long-term survival could hinge on getting enough Chinook. The number of harbor seals in the inland waters of Washington state now totals somewhere around 10,000 or slightly higher, according to the latest estimates by Steve Jeffries, a marine mammal biologist with the Washington Department of Fish and Wildlife. 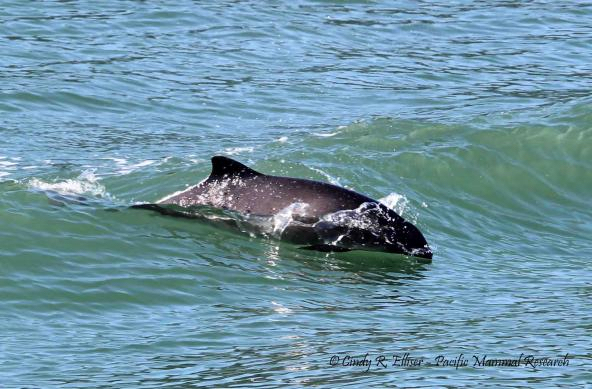 Harbor porpoise surfing in a boat wake in Burrows Pass, off Fidalgo Island. But did you know that harbor porpoises, which eat many of the same things as harbor seals, now number around 11,000 in the same general area? That’s according to a recent study for the Navy led by research consultant Tom Jefferson. I have to say that those numbers came as a major surprise to me, and I began to ask questions about what all these porpoises in Puget Sound might be doing to the food web, which involves complex interactions between salmon, seals, porpoises, orcas and many other species. The result of my inquiry is a story published this week in the Encyclopedia of Puget Sound. I’ve often wondered how well Puget Sound’s endangered orcas would be doing today if these whales had not grown up within a culture of eating chinook salmon. In Iceland, some killer whales apparently feed on both fish and seals, depending on the time of year, according to researcher Sara Tavares of the University of St. Andrews in Scotland. The same animals have been seen among large groups of orcas as they pursue schools of herring in the North Atlantic, she writes in her blog, Icelandic Orcas. The Icelandic whales have a different social structure than the fish-eating Southern Resident killer whales that frequent the Salish Sea. Both groups are also quite different from the marine-mammal-eating transient killer whales that have been visiting Puget Sound more frequently in recent years. I’m increasingly amazed at the interwoven nature of the Puget Sound food web. Whenever I become focused on a specific species — Chinook salmon, for example — one of the first questions I ask is: What is this species eating? I soon learn that the answer depends on the size of the individual doing the eating. Prey for a baby salmon is much different from prey for an adult. If you really want to learn about why a species is doing well or poorly, you need to look beyond prey availability for your species of interest and find out what the prey are eating as well. Healthy prey must be abundant for any species to do well, so the prey of the prey must also do well. Salmon have a tough life. Not only must they escape predators and find enough food to eat — as do all wild animals — but they must also make the physiologically taxing transition from freshwater to saltwater and then back again to start a new generation. In a four-part series being published in the Encyclopedia of Puget Sound, I explain some of the latest research findings about how chinook, coho and steelhead are struggling to survive in the waters of Puget Sound. The first part is called “Opening the black box: What’s killing Puget Sound’s salmon and steelhead?” It describes the Salish Sea Marine Survival Project, a major research effort involving more than 200 scientists in the U.S. and Canada. The effort is coordinated by Long Live the Kings in the U.S. and by the Pacific Salmon Foundation in Canada. The second part, titled “Size means survival for salmon,” takes a look at salmon and steelhead’s place in the food web from the “bottom up,” as they say. Specifically, what are the fish eating and what is limiting their access to a healthy food supply? Still to come are discussions about predation (“top down”) in Part 3, and other factors that affect survival, such as disease and chemical exposure, in Part 4. Our goal for this project has been to describe the important research findings in careful detail without getting lost in complex scientific analysis. I also describe, at the end of Part 1, some new findings regarding potential competition among salmon for food in the Pacific Ocean. Could we ever reverse the trend of shrinking Chinook salmon? There are plenty of reasons why we should strive for larger Chinook, not the least of which is the pure joy of seeing — and perhaps catching — a giant salmon. But I’m also thinking about our endangered Southern Resident killer whales, which don’t seem to find Puget Sound very hospitable anymore. As we know, the whales favor Chinook over any other food. While it might take more energy for a killer whale to chase down a large Chinook versus a smaller one, the payoff in nutrition and energy far outweighs the expenditure, according to Jacques White of Long Live the Kings, who has been thinking about the size issue for some time. In terms of competition, a giant returning Chinook might be difficult for a harbor seal to handle, and that could give the orcas a special advantage. Still, we are learning that harbor seals create problems for the Chinook population by eating millions of tiny smolts migrating to the ocean before they get a chance to grow up. Perhaps the major reason that Chinook have declined in size is the troll fishing fleet off the coast of Alaska and Northern Canada, Jacques told me. It is almost simple math. It takes six, seven or eight years to grow the really large Chinook in the ocean. Today’s fishing fleet goes out into the middle of the Chinook-rearing areas up north. The longer the fishing boats stay there, the more likely it is that they will catch a fish that could have grown into a really big one. Years ago, the fishing boats did not travel so far out to sea, Jacques said. There was no need to travel far when plentiful runs of salmon came right into the shore and swam up the rivers. In additional to the trollers, plenty of sport fishermen have taken the opportunity to catch and take home nice trophy fish, putting extra pressure on the biggest members of the fish population. Fishing derbies, past and present, challenged people to catch the biggest Chinook. Long Live the Kings, a conservation group, once held fishing derbies, Jacques noted. But, after giving it some thought, everyone realized that the effort was counterproductive. “Long Live the Kings is now out of the derby business,” he said. Gillnets, once common in Puget Sound, entrap fish by snagging their gills. Gillnets tend not to catch the truly giant salmon, because of the mesh size, but they do catch the larger salmon. Often only the smaller ones make it through to spawn — and that breeds another generation of small fish. Fishing is not the only factor that tends to favor the survival of small fish, but it tends to be a big factor, according to Tom Quinn, a University of Washington professor of aquatic and fishery sciences. The issue is complicated, and every salmon run has its own characteristics, he said. Hatcheries, dams and habitat alterations all tend to favor fish that can compete and survive under new conditions, and often those conditions work better for smaller fish. 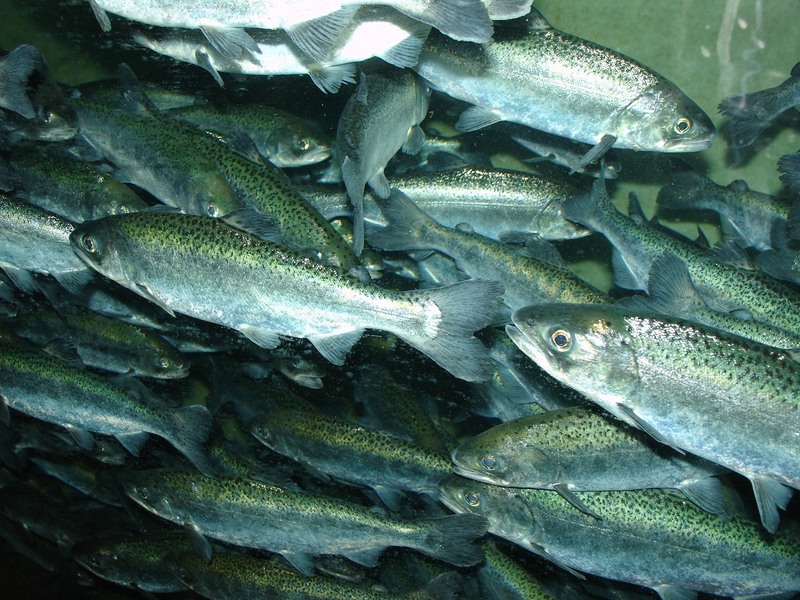 Changes in the food web may create a nutritional deficit for some salmon stocks, and competition at sea with large numbers of hatchery fish may be a factor. Check out the study in the journal Plos One by researchers for the Alaska Department of Fish and Game. With the removal of two dams on the Elwha River, I’m hoping that experts can make sure that the conditions will be right for larger fish — if they can survive to make it home. Quinn, along with doctoral student Michael Tillotson, recently published a paper showing how fishing seasons alone can alter the genetic makeup of a population along with the behavior of individual fish. Although these characteristics are not necessarily related to the size of fish, it directly affects the fitness of the population. When people are fishing on wild stocks during open season, a fish has the best chance of survival if it shows up before the fishing season begins or after the fishing season is over. But that is not nature’s way. Through evolution, the greatest number of fish tend to come back when environmental conditions are optimal for migration, spawning and smolt survival. If fishing seasons are timed for the peak of the run, that will reduce the percentage of fish taking advantage of the best conditions. Over time, the population gets skewed, as more fish come back during times when conditions are less than optimal. The result is likely a lower survival rate for the overall population. The real crunch could come in the future as a result of climate change. If temperatures or streamflows become more severe, the fish may be in a no-win situation: If they show up at the most optimal time, they are more likely to get caught. if they come early or late, the environment could kill them or ruin their chances of successful spawning. Certain behaviors are bred into wild fish over many generations, and some traits are connected to their timing. Whether they feed aggressively or passively can affect their survival. Some salmon will wait for rain; others will wait for the right streamflow or temperature. Some smolts will stay in freshwater for extended periods; others will move quickly to saltwater. It’s not a great idea when fishing seasons, rather than environmental conditions, dictate fish behavior. The move to mark-selective fishing — which involves removing the adipose fin of all hatchery fish before they are released — can help solve some problems for wild fish, Tom told me. Under selective fishing rules, fishers are allowed to keep the hatchery fish with a missing fin, but they must release the wild ones that still have all their fins. Some of the wild fish die from injury, but most of them survive, he said. The key to the problem is a better understanding of the genetic makeup of the individual stocks while increasing the effort to maintain a high-level of genetic diversity. That’s an insurance policy that allows the fish to survive changing conditions. The genes for giant Chinook have not been lost entirely, as I pointed out in Water Ways on Nov. 25. If we want to have larger Chinook, we must protect the individual Chinook that are larger. That could mean reduced ocean fishing, selective fishing for hatchery populations, and requirements to release fish larger than a certain size. Perhaps it would even be possible to selectively breed larger Chinook in a hatchery for a limited time to increase the size of the fish. It won’t be easy, because these notions involve messing with billions of dollars in the fishing industry, not to mention complicated international relations. I will save discussions about the Pacific Salmon Treaty for another day. I will just say that this treaty is supposed to be between the U.S. and Canada. But negotiations involve tradeoffs among Washington, Canada and Alaska. Even the Endangered Species Act can’t always protect wild Puget Sound Chinook from being caught in Alaska, with the ultimate outcome that fewer fish make it home to spawn. What would it take to restore the legendary Chinook salmon? Giant Chinook salmon of 50 pounds or more have not yet faded into legend, as operators of a salmon hatchery in Central British Columbia, Canada, can tell you. Ted Walkus, a hereditary chief of the Wuikinuxv First Nation, holds a Chinook salmon caught this year for the Percy Walkus Hatchery on the Wannock River in Central British Columbia. The annual spawning effort at the Percy Walkus Hatchery on the Wannock River involves catching Chinook as they move upstream rather than waiting for them to arrive at the hatchery. This year, fishing crews brought home a remarkably large fish that has lived long and prospered. The progeny of this fish will be returned to the river from the hatchery to continue the succession of large Chinook. These big fish compare to the massive Chinook that once made their way up the Elwha River and other major salmon streams of Puget Sound. 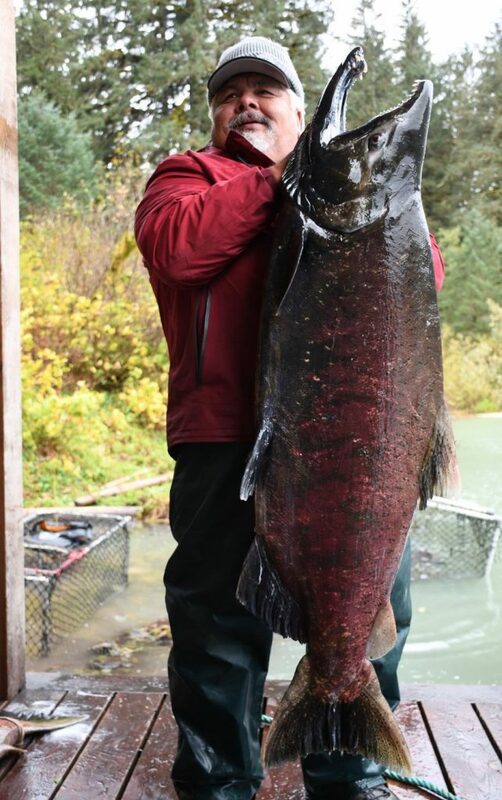 Knowing that these big fish still exist provides hope that we might someday see such large salmon on the Elwha, following the recent removal of two dams and ongoing habitat restoration. 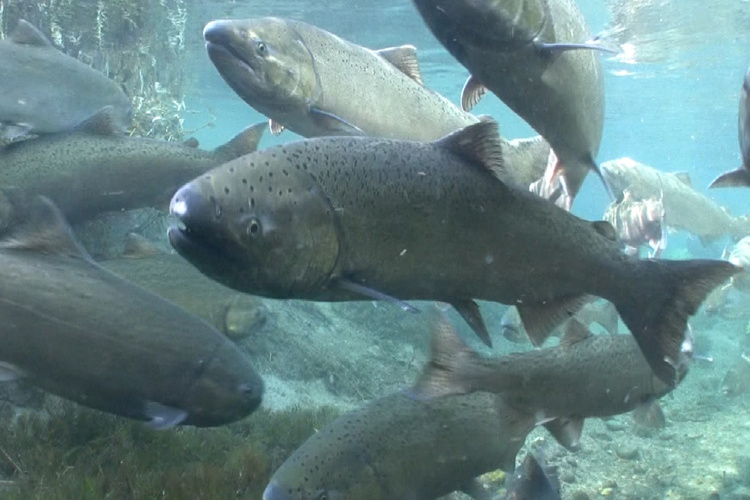 Large, powerful Chinook are suited to large, powerful streams. Big chinook can fight their way through swifter currents, jump up larger waterfalls and protect their eggs by laying deeper redds. Experts aren’t sure that the conditions are right for large Chinook to return to the Elwha, but many are hopeful. I explored this idea in a story I wrote for the Kitsap Sun in 2010. As for the two-year-old Percy Walkus Hatchery, big fish are not uncommon in the Wannock River, as you can see in the hatchery’s Facebook photo gallery. By spawning both large and smaller salmon, the hatchery hopes to rebuild the once-plentiful numbers of Chinook in the system. Involved in the project are the Wuikinuxv First Nation along with Canada’s Department of Fisheries and Oceans and others. Ted Walkus, a hereditary chief of the Wuikinuxv and the man featured in the photo on this page, said the largest fish need to remain part of the gene pool for the hatchery and the river. That’s why volunteers go out into the river to take the brood stock. This year, 47 males and 47 females were spawned to produce more than 300,000 fertilized eggs. “If you catch a 60-pound salmon and you keep it without breeding, that part of the gene pool eventually gets wiped out,” Walkus was quoted as saying in a CBC News report. For similar reasons, some anglers choose to release their catch alive, if possible, after getting a photo of their big fish. The hope, of course, is that the fish will continue on and spawn naturally. In the hatchery, the genes will be passed on to more salmon when the progeny are released. Unfortunately, I was unable to quickly locate a facility management plan for the Percy Walkus Hatchery to see if anyone has projected the long-term effects of the hatchery. Chet Gausta, middle, shows off the big fish he caught off Sekiu in 1964. Chet's younger brother Lloyd, left, and his uncle Carl Knutson were with him on the boat. Big fish are genetically inclined to stay at sea five, six or seven years rather than returning after four years. They must avoid being caught in fishing nets and on fishing lines during their migration of up to 1,000 miles or more before making it back home to spawn. Perhaps you’ve seen historical black-and-white photos of giant Chinook salmon taken near the mouth of the Elwha River. Like the giant Chinook of the Wannock River, some of these fish are nearly as long as a grown man is tall. Catching them with rod and reel must be a thrill of a lifetime. Some of those giants — or at least their genes — may still be around. 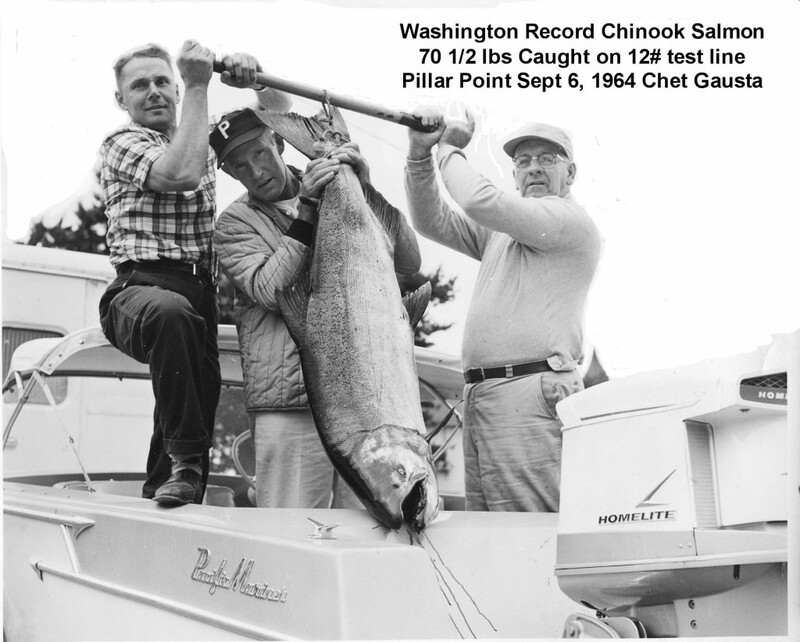 The largest Chinook caught and officially weighed in Washington state dates back to 1964. The 70-pound monster was caught off Sekiu by Chester “Chet” Gausta of Poulsbo, who I wrote about upon his death in 2012. See Water Ways, Feb. 3, 2012. His photo is the second on this page. There’s something to be said for releasing salmon over a certain size, and that goes for commercial fishing as well as sport fishing. Gillnets, for example, target larger fish by using mesh of a certain size, say 5 inches. Smaller fish can get through the nets, spawn in streams and produce the next generation — of smaller fish. The genetic effects of removing the larger fish along with the effects of taking fish during established fishing seasons artificially “selects” (as Darwin would say) for fish that are smaller and sometimes less fit. Some researchers are using the term “unnatural selection” to describe the long-term effects of fishing pressure. I intend to write more about this soon and also discuss some ideas for better managing the harvest to save the best fish for the future. It’s always been troubling to me that the Southern Resident killer whales, which frequent Puget Sound, have struggled to maintain their population, while other fish-eating resident orcas seem to be doing much better. 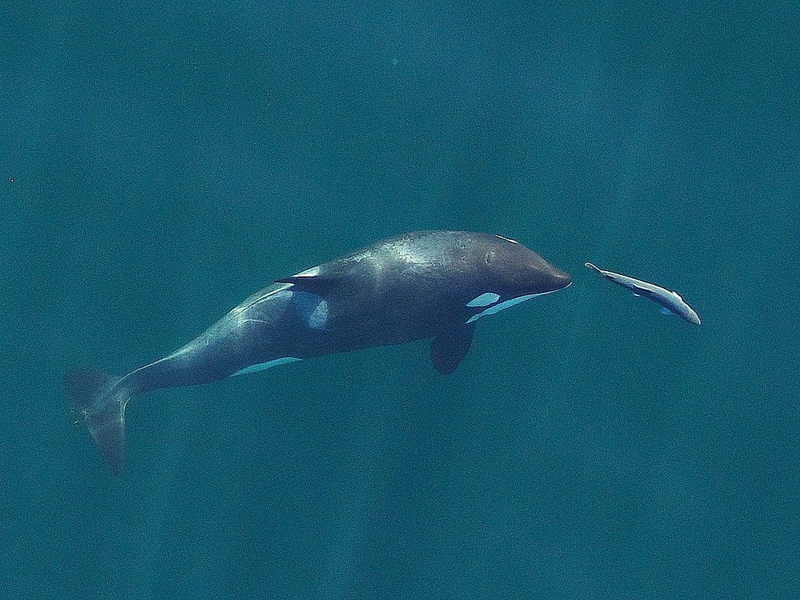 “Puget Sound’s endangered killer whales are waiting at the end of a long food line for a meal of chinook salmon — basically the only food they really want to eat. My story contains plenty of numbers to explain what this is all about. From a historical viewpoint, the answer must be that we have too few salmon. But from a management perspective, we might have to conclude that the ecosystem is out of balance and that we have been restoring some marine mammal populations faster than we are restoring the salmon that they eat. In an intriguing study published in March in the journal Nature Ecology & Evolution (PDF 840 kb), a group of West Coast researchers investigated whether it is better to recover populations of prey species first, followed by predator species, or if it is better to recover predator species first, followed by prey species. Protecting predators first — which is usually the way humans do things — may slow the growth of prey species or even trigger a population decline, the report says. That creates a problem for predators that specialize in that one kind of prey as well as for those that have no access to alternative prey. It may seem logical to rebuild the prey species first, the authors say. But, with some exceptions, recovering prey species first causes the combined predator and prey populations to peak at high levels that are unsustainable in the overall ecosystem. The authors conclude that the fastest way to restore depressed populations is through synchronous recovery of predators and prey by carefully rebuilding two or more populations at the same time. Management tactics may include culling predators even before optimal population numbers are reached. Such actions require careful study, as culling may produce unexpected consequences, according to the report. Other options include protecting multiple species within protected geographic or marine areas or focusing on single species by protecting select habitats or reducing human exploitation. For Southern Resident killer whales, the question will be whether populations of other marine mammals — particularly harbor seals in Puget Sound —should be controlled. If so, how would people go about doing that? One related issue that needs more study is the effect that transient killer whales are having on the Salish Sea population of seals and sea lions. As the Southern Residents spend less time searching for chinook salmon in the inland waterway, the seal-eating transients are being spotted more and more by people along the shores of Puget Sound. Some studies estimate that the transients need an average of one to two seals each day to maintain their energy needs, although we know these whales also eat smaller sea otters and larger California and Steller sea lions, as well as an occasional gray whale. Are the transients culling the population of harbor seals in Puget Sound or at least limiting their growth? Even before the transients were showing up frequently, biologists were telling us that the overall harbor seal population appeared to be peaking and perhaps declining. It would be interesting to create a future-looking computer model that could account for populations of salmon and marine mammals under various scenarios — including possible management actions by humans and the ongoing predation by transient killer whales. If we want to keep things more natural while helping out the Southern Residents, maybe somebody could come up with a strategy to attract and maintain a healthy population of seal-eating transient orcas within the Salish Sea.